The 'Solution Series' are ebooks with exercise programs designed to provide comprehensive treatment for a variety of common sports injuries. Sports injury rehabilitation can be time consuming and expensive. And when you don't get the results you want, it becomes frustrating. From patella femoral syndrome, to ACL tears, these inexpensive ebooks can put you on the road to recovery. The first in the series, Ankle Sprain Solutions, launched in the spring of 2007. It provided all of the information needed to treat an ankle sprain - from acute treatment using the R.I.C.E principles, to range of motion and strengthening exercises to return normal function. The series now consists of six different programs, each containing an injury specific exercise program. And don't forget the 'Solution Series' exercise bands. These elastic bands are custom made by Sports Injury Info and Maximum Training Solutions, and are used for many of the exercises within the programs. If you suffer from patella femoral syndrome, this is your key to finally eliminating your knee pain. Not just another VMO strengthening program, Patella Femoral Solutions will show you what you've been missing in your rehab, and eliminate your knee pain once and for all. 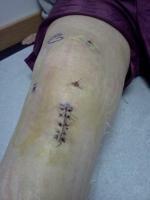 ACL injuries are all too common among athletes. This program can give you the edge you need to help prevent ACL injury. And if you are recovering from ACL reconstruction, ACL Injury Solutions will show you exactly what you need to be doing in order to prevent a second ACL injury. Hip flexor injuries often become chronic because of poorly focused rehabilitation. Hip Flexor Solutions can help you prevent future injuries, as well as help improve your strength, quickness, and explosive power. A pulled hamstring can be a recurring injury, especially if not rehabilitated with a focus on how the hamstrings actually function. Hamstring Solutions provides a complete program for training your hamstrings and entire body the right way. If you have suffered from an ankle sprain, then you know how it can become a nagging, recurring injury. Ankle Sprain Solutions can show you all of the exercises you need to prevent future injuries, and eliminate your ankle pain. The sixth 'Solutions Series' ebook, this comprehensive program focuses on eliminating chronic foot and ankle pain. Whether you are suffering from arch pain like plantar fasciitis, achilles tendonitis, pain after an ankle fracture, or any other type of foot pain, this program will help you fix underlying causes of mobility restrictions and strength to eliminate your foot pain once and for all. The Solution Series Elastic Band is a specially designed exercise band featured in all of the Solution Series Ebooks. You won't find a more versatile or durable exercise band anywhere else. Videos demonstrating select exercises from the Solution Series Ebooks. These videos are older and are not of the highest quality, but they provide some guidance regarding form for the exercises. All transactions are completed through PayPal. Ebooks are available for immediate digital download. Solution Series bands ship within 1-2 days, based on inventory.